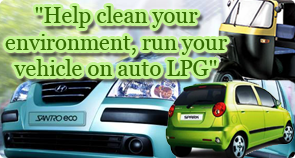 Home»Why Auto LPG»Auto LPG is Safe!! Autogas - also called Automotive LP Gas - is the most widely used alternative fuel for road transport, powering more than 27 million vehicles worldwide. Apart from its environmental and economic benefits, Autogas has also been shown to be one of the safest automotive fuels. While there is considerable awareness of the environmental and economic benefits of autogas, it is also important to note that autogas is an especially safe vehicle fuel with an outstanding health and safety record. With over 27 million vehicles on the road worldwide, autogas has demonstrated a strong safety record, better than vehicles operating on traditional fuels such as gasoline. There are two fundamental reasons behind the inherent safety of autogas: the structural integrity of the autogas fuel system; and the physical qualities of autogas as a fuel. To prevent and minimise fuel hazards, the LP Gas industry has developed stringent standards and regulations in design, manufacturing and installation of autogas parts and equipment that are constantly updated to adapt to the evolution of technologies. In fact, a world-wide harmonisation of safety rules related to the design, manufacturing and installation of autogas components is in progress with governmental authorities through the United Nations/Economic Commission for Europe and a parallel effort led by the LP Gas industry. Autogas vehicle tanks are manufactured to meet or exceed the most stringent standards and rigorous crash tests demonstrate that autogas tanks are stronger than conventional fuel tanks. Constructed from composite and carbon steel, they are 20 times more puncture resistant and will survive much greater impacts than a typical gasoline, methanol or ethanol tank. Modern autogas fuel systems are protected by advanced pressure regulators and safety valves. In many cars, onboard gas detectors and other safety valves allow fuel flow only when the engine is operating. Fuel systems are also fitted with shut-off valves that function automatically if the fuel line ruptures, meaning that gas can no longer flow from the tank. Autogas tanks are also manufactured with a device that shuts off the filling process when the tank reaches 80 percent of its liquid capacity, allowing for temperature related changes in fuel volume without any release of gas from the tank. In the event of a serious accident, the tank and associated autogas pipes are protected with numerous safety devices, electronic and mechanical, to prevent and control the escape of the autogas should a pipe be severed. If the vehicle should catch fire in the event of an accident, the autogas tank is designed to control its pressure via a pressure relief valve saving the tank from rupturing and causing further damage. Autogas : An inherently safe and cleanfuel. Autogas is a safe, clean fuel which has been used for household cooking and heating purposes for many years. It is a non-toxic fuel that doesn't contaminate aquifers or soil. Autogas has the lowest flammability range of any alternative fuel. Moreover, its auto-ignition temperature is higher than that of gasoline. Autogas also has a closed fuel system where fitted valves move the fuel from pump to vehicle tank without exposure to the outside environment, preventing fuel spillage and evaporation. 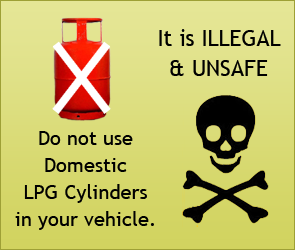 Why are there concerns about Auto LPG Safety? vehicles. Another study by the Belgian research organisation DNV demonstrated that the risk of tank rupture is higher with gasoline than with autogas. These findings are supported by the fact that there is no increase in insurance premiums for autogas vehicles - reflecting the statistical safety record of autogas vis-à-vis all other automotive fuels. Moreover, it is revealing to note that one of the more popular and wide-spread engine applications for autogas is the public school bus. Government decisions to use clean, safe and economical autogas to transport community school children is a clear endorsement of the autogas safety record. That there are compelling environmental, operational and safety reasons for including autogas in any strategy aimed at promoting alternative fuels for road transport.